Dinner at The Spoke Club is always a treat, especially when you have Executive Chef Rob Klunder (Instagram: @rkbones) cook for you. I was all set for another visit since the last time I was at the members-only restaurant was more than six months ago (truth be told, I heard through the grapevine that chef Rob had a new menu out so the eager beaver in me wanted to check that out ASAP). Seeing that my brain is usually fried by the end of the work day I knew doing a tasting would be my best bet because at times, deciding on what to order can be a very strenuous process for me. I'm sure questions like "What should I order? ", "Should I have this, that, or both? ", "Can't I just order everything? ", or "Is this too much food?" have killed plenty of brain cells. Considering that I'm not getting any younger and keeping my brain in top shape is priority, I usually get around this by asking the chef whether he/she can prepare a tasting for me; a smaller, tasting portion of selected dishes from the menu (sometimes the chef may bring out several off-menu dishes too). Some chefs do this, some chefs don't. Either way, if you're ever interested in doing a tasting you can always ask when you're making a reservation. Anyway, having chef Rob tell me "I'll keep on bringing food out until you tell me to stop" was literally music to my ears. Just make all the decisions for me, please and thank you, chef! I'm not sure about you but I always trust that the chef knows best. After all, it's their food and they're in charge of the kitchen. They are in their element so they must know what's good. First things first, I need to apologize because what you see on this post is actually not chef Rob's newest menu; a newer menu was launched last Thursday. Due to my tardiness in getting this post up along with chef Rob's passion for using the freshest seasonal ingredients, this post has become somewhat obsolete. Okay, maybe not obsolete but just keep in mind that The Spoke Club is serving another menu now so what's on this post may not be available anymore. Even though that's the case I still wanted to post about my dinner because I always have fantastic food at The Spoke Club and I feel that's worth sharing. The difference between this tasting and the tasting I had last time is that this one had dishes that were mainly from The Spoke Club's regular menu whereas the one last time was all off-menu plates. To begin, I was served thin and crispy taro chips (my favourite kind of "specialty chips") and a warm, pillow-y brioche. The brioche was so out-of-this-world-good that I had to stop myself from eating the entire thing (I constantly had to remind myself that there's more food coming). Sure enough, what came next were several Asian-inspired dishes - potstickers, crispy tyhpoon chicken and the nasi goreng - and a wonderful lobster boudin in a rich broth and a light and foamy tarragon sabayon. What followed were fun bites of foie gras poutine, perogies and calamari & monkfish dressed in chipotle adobo. The highlights of the dinner for me were the last three courses: the smoked oyster (beautiful presentation), pan-seared diver scallops w/ guanciale bits (can I have five of those? 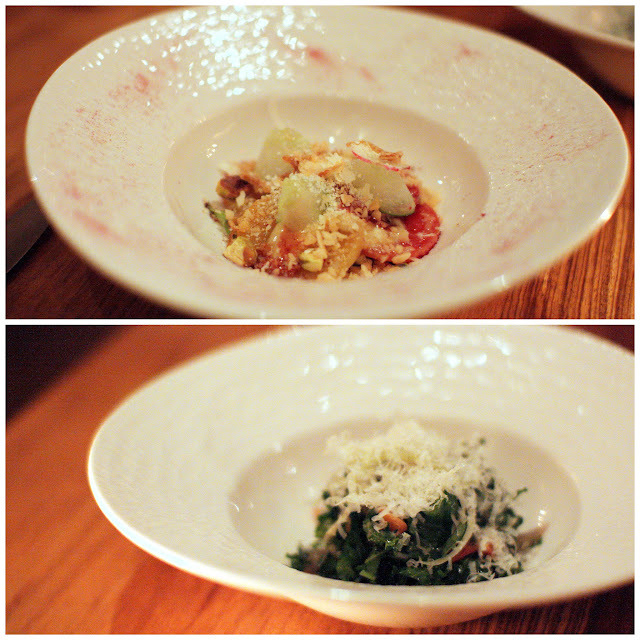 ), and the beet and ricotta agnolotti with black truffle and crunchy pistachio. I've probably said this before but I'll say it again - it's a shame that not more people get to enjoy chef Rob's food, and I'm so glad I'm one of the lucky ones!